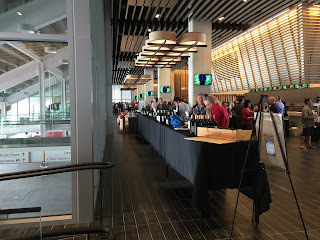 Sue and I attended the first ever Silicon Valley Wine Auction's Grand Wine & Food Tasting, an event benefiting the Silicon Valley Education Foundation. 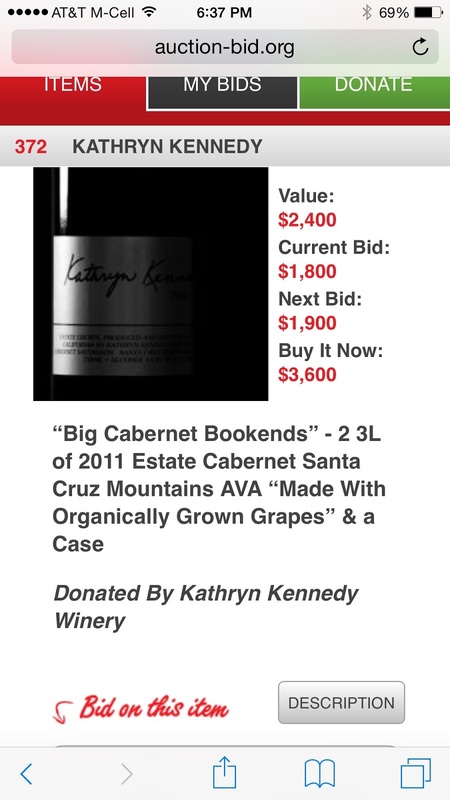 Tickets were $150, but if you belonged to a Santa Cruz Mountains winery then you received a coupon for $50 off. 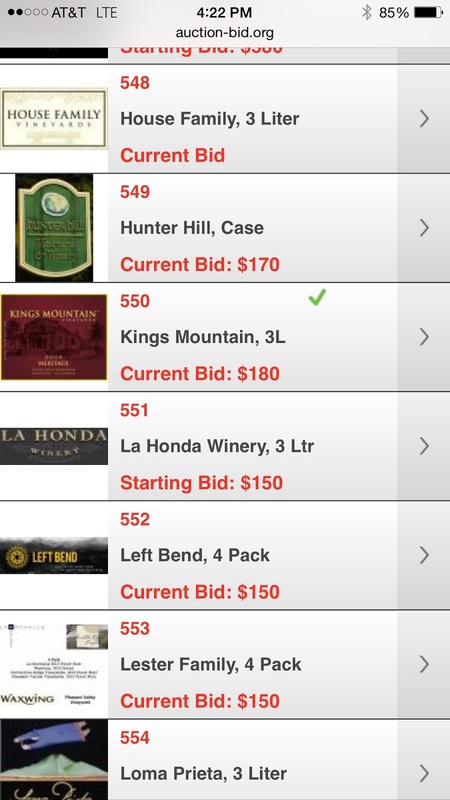 $100 a head is not inexpensive by any means but is inline with the other two Santa Cruz Mountains winery events, Pinot Paradise at $85 and Premier Cruz at $150. 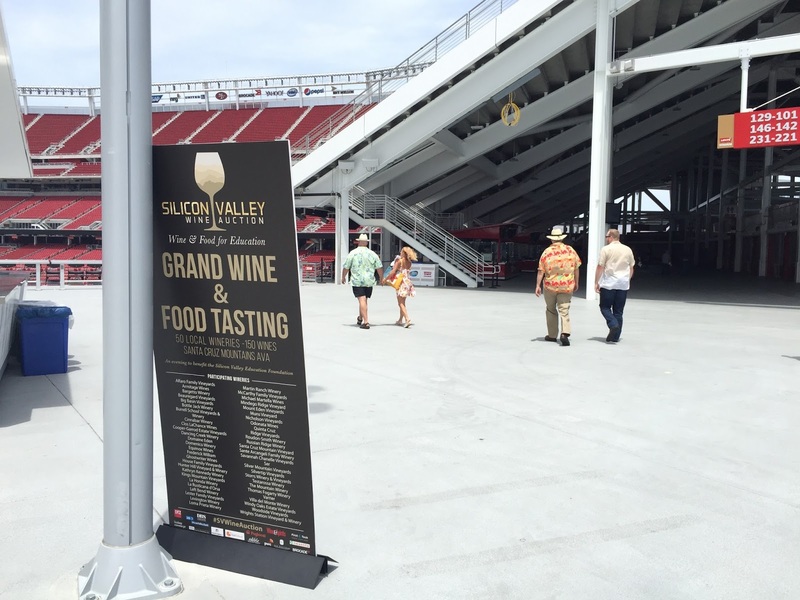 The event took place at the impressive and beautiful Levi Stadium in the 501 club. We were told it was going to be outside and had prepared with sun block and hats. It was apparently moved inside due to the stage set up. This was probably a good thing. 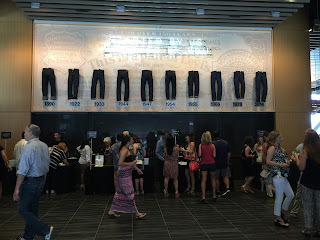 It's hard to imagine that it would have been as impressive outside in the heat; the 501 club was very spacious and cool climate wise. 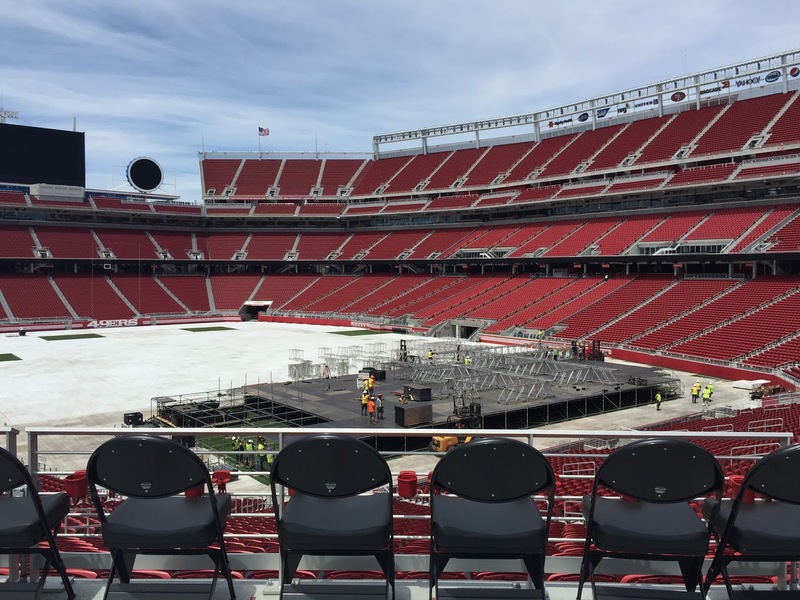 Two patios were open to view the stadium. According to the friendly staff, workers were setting up the stage for 2 shows of The Grateful Dead the following weekend. One can only imagine the cloud that will be hovering over the stadium. Food was very nice, a good selection of cheese and charcuterie along with 3 different types of sliders. The wine was excellent, as you can expect from the Santa Cruz Mountains. 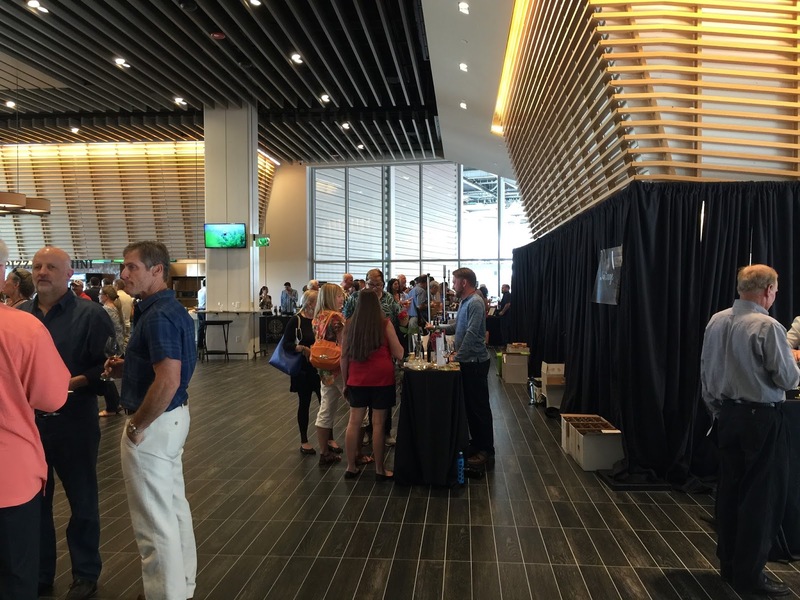 Over 50 wineries were serving tastings of their best. 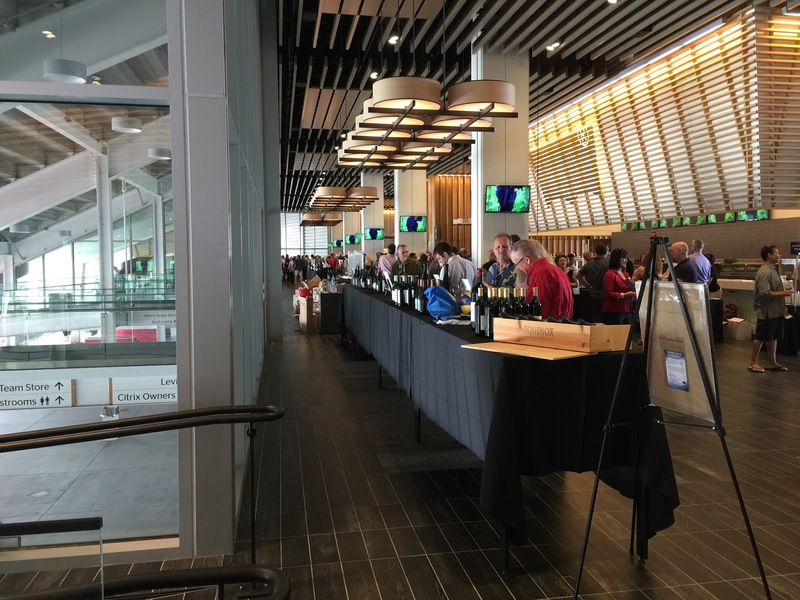 When encountering this many wineries you have to pick and choose very carefully, otherwise they'll be pouring you out of the place. I could learn to taste and spit, but what fun would that be; I'm an enthusiast, not a professional. We usually start with wines we're less familiar with or have never tried and then pick and choose at our whims. They shared 3 Pinots, the Santa Cruz Mountains Mt. Roberta Vineyard being our favorite. Their tasting room is in Aptos, we're going to have to make it down there. Coincidently we picked up a bottle of their Chalone when visiting the Summit Store looking for < $30 Santa Cruz Mountains Pinots. Curtis was recommending it. He shared a nice Santa Cruz Mountains Syrah with us. He is a very small producer, 75 - 150 cases a year, mostly selling to restaurants. Their Ahlgren/Mt. Madonna Santa Cruz Mountains Pinot was very nice. They cleared up the mystery of Santa Cruz County which means the wine doesn't qualify for the < $30 Santa Cruz Mountains Pinot tasting. We'll be forced to enjoy it at our leisure. Their 2013 Santa Cruz Mountains Pinot was their first vintage and was very nice. 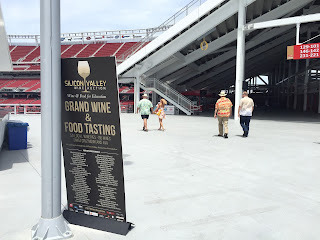 They do not have a tasting room, but are available via their website or at local retailers. Many of our favorites were there. Dave and Katrina were pouring their Chard, Pinot, Syrah, and Merlot. We enjoyed a taste of their Pinot. Dave had a 5L of something on the silent auction. We couldn't find it on the table and their weren't any details on the web site, so we had to ask. He got it cleared up on the site. I hope they found the bottle. We tried their Lester Family Vineyard. It was very nice. We had been meaning to hit Cinnabar ever since this had been recommended when we visited Sante Arcangeli a couple of weeks back. Dave House still hasn't enjoyed the nebuchadnezzar of Premier Cruz cuvee from a few years ago. I still think about that bottle. We enjoyed some of their luscious Estate Cabernet. It's always a treat. We enjoyed their 2010 Pinot. They also are now offering a more Californian styled Pinot, the Bacchus. I'm uncertain on this. Perhaps more tasting is in order to convince me. Tom Fogarty Jr served us their excellent Cab Franc and Apex. We've been waiting for the Apex to show up on the market so we can pick up a bottle for our good friend Mark Romano, who had really liked it at Premier Cruz. Tom said it was going to happen in 2 to 3 weeks. We had a fun chat with Neil as we enjoyed some of their Pinot and Cab. Judy treated us to some wonderful Dianne's block Pinot. The auction was fun. There was a good selection of large format bottles and cases. Although some of the minimum bids for the cases seemed a bit hefty, there were definitely deals to be had. The auction was run by GiveSmart. They used a web site to run the auction. You could monitor your bids from your phone. It was convenient and pretty cool to boot. Overall we had a great time. I would probably attend again. 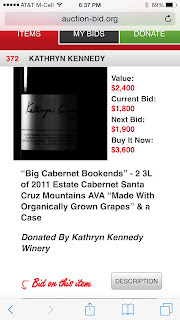 We didn't attend the $550 a head Wine Dinner and Live Auction, but because I had participated in the tasting auction I was able to see the silent auction items and bids. I'm pretty sure it was a tad above my pay grade. 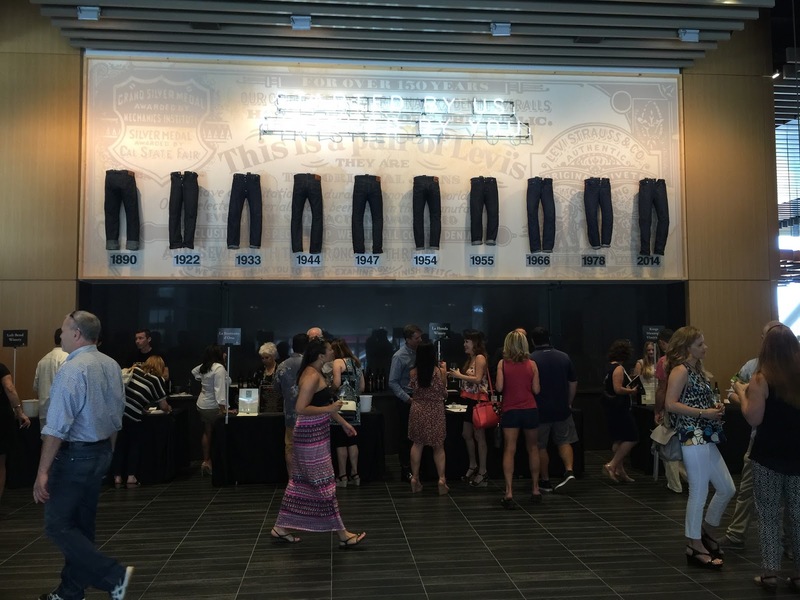 The San Jose Mercury News reports they raised over $600,000.